Take yourself back to July 19, 2015. 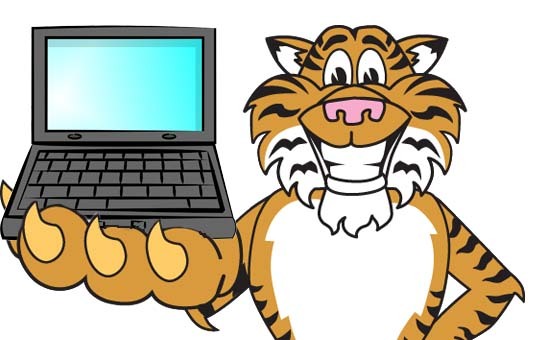 The Tigers were hurdling toward their first losing season since 2008 and were about to sell at the deadline in a way we hadn’t really seen in a decade. Things were bad. That night, Justin Verlander threw 3.2 innings agains the Orioles and allowed seven runs. It was the seventh shortest outing of his career, and one of the other six included an injury removal. Things were very bad. At that moment, not only were the Tigers at an organizational crossroads but one of their two stars looked nearly cooked. Verlander had struggled his way through parts of 2013, all of 2014, and then missed the first half of 2015. And he was not pitching well in his post-injury return to action through mid-July. Between the start of 2014 and July 19 of last year, Verlander had a 124 ERA- spanning 240 innings. While we typically don’t lean on ERA too much at this site, any time you’re allowing 25% more runs than average over more than a full season, it’s not exactly a good thing. And while his FIP- sat at 102 over that period, that’s not the ace the Tigers had come to know. From 2009 to 2013, Verlander wasn’t necessarily the best pitcher in the league, but he was absolutely one of the pitchers who could claim that title. The list includes names like Kershaw, Hernandez, Lee, Wainwright, and some others depending on how you like your innings restrictions. Put simply, he was a legitimate #1 starter. And then he was somewhere between average and terrible, depending on your metric of choice. During the Dark Times, there was a range of opinions. Some chalked it up entirely to health. Others (myself included), split the difference, calling some of the problem health and some normal aging. He wouldn’t be this bad, I said, but sustained dominance was probably in the rear view mirror. There would be good nights, maybe even great ones, but they would be less frequent. The old Verlander was gone, even if Verlander himself wasn’t exactly dead. You know how this story ends, mostly, so I will cut the preamble here and present the most heartening table of the New English D era. Since that awful night against the Orioles, not only has Verlander turned himself around, he’s pitching almost exactly like he was when he was king of all creation. His strikeout and walk rates are the same. His ERA and FIP are basically the same. He’s averaging essentially the same number of innings per start. Over the last 54 weeks, Justin Verlander has been JUSTIN VERLANDER. If you like things in graph form, here it is. This looks less impressive though, because ERA and FIP aren’t league adjusted like the minus stats in the table. There’s a lot more run scoring in the game in 2016 than there was in 2013, but still it looks cool. The peak is July 19, 2015. Ace-era Verlander had a 77.6% contact rate against. Dark Times Verlander was 81.5%. Over his last 36 starts it is 76.9%, better than it was at his peak. We’ve seen better velocity lately and he’s shifted the slider into a cutter, but it’s not as if he’s some totally differnt pitcher. Pitching is a complicated act, repeated thousands of times over a single seasons. If your body is out of whack, even those with plenty of talent can wind up losing their margin for error. If you lose a little velocity, a little bite, and a bit of command, you’re going to be in trouble quickly. I don’t think there’s some magical thing Verlander figured out last July, it’s just that he finally got to a place where he felt 100% on the mound and got out of the bad habits he developed during the Dark Times. He’s not letting fastballs drift back over the plate to right-handed hitters and the secondary stuff is doing what it’s supposed to. At 33, we shouldn’t expect invincible Verlander to continue forever, and the fact that he went down once already should warn us about the fragility of greatness, but he’s reestablished his level. He’s going to age and decline in the years ahead, but he’ll be declining from a high peak rather than a middling floor. 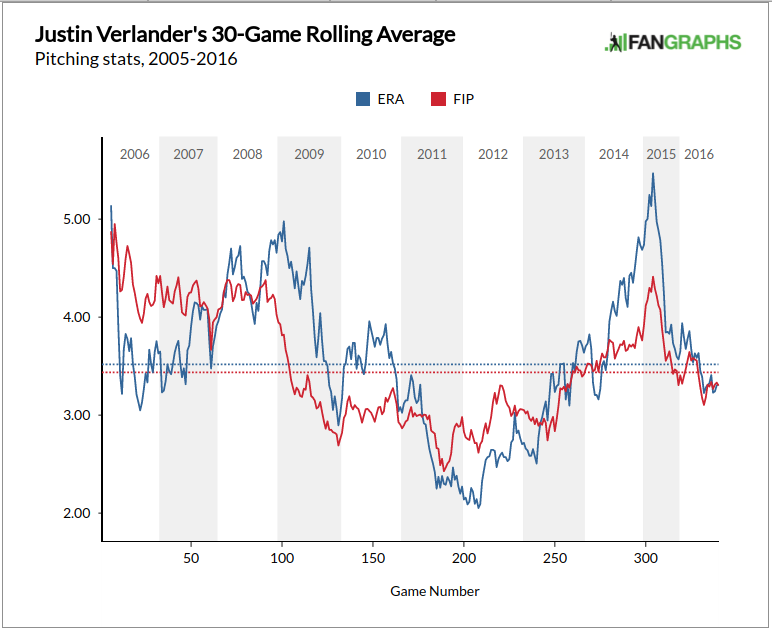 Over the last calendar year, Verlander is 4th in fWAR and 8th in RA9-WAR. He’s pitching deep into games and doing it well, just like he was when he was in the conversation for the best pitcher in the game. A year ago, I figured his shot at the Hall of Fame was gone, but he’ll finish his age-33 season around 52 WAR. He’s got three more years on this deal and could probably pitch a couple more after that. The bar for starters to get into the Hall is currently very high, but with new voters coming into the system it’s not hard to imagine that when he’s on the ballot in 11-12 years, he’ll have a receptive audience. The Tigers may or may not seal the deal over the last two months of 2016. They might miss the playoffs and there will be questions to answer about how they built the staff and whether Upton was a good signing, but the biggest question we had about the Tigers going into 2016 has been answered emphatically. Justin Verlander is back.